Note: This post is very specifically about one kind of question. For a broader treatment of function notation, click here. Ah, function notation, that old SAT math bugaboo. I often find that otherwise strong students still struggle with questions that combine graphs and function notation. I’m here to tell you today that, if you’re willing to put in a few minutes of focused practice here, you’ll need not fear these questions any longer. Let’s just get right into it with an example. 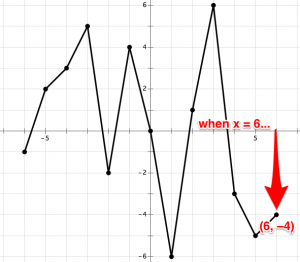 The figure above shows the graph of f(x) from x = –6 to x = 6. If f(3) = p, what is f(p)? To solve a question like this, you must remember a simple but important fact: “f(a) = b” is just shorthand for saying “the function f contains the point (a, b).” So when this question tells you that f(3) = p, it’s telling you that the function f contains the point (3, p). All you need to do is go to the graph and see where it is when x = 3. 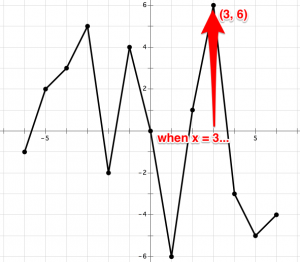 When x = 3, the graph of the function is at (3, 6). So f(3) = 6, and therefore p = 6. And now you’re almost done. 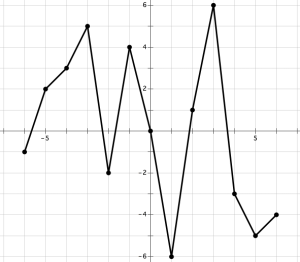 To finish up, just go to the graph one more time to find f(p), which you now know is really just f(6). And there you have it. (A) –4 is your answer. Becoming deft with questions like this just requires practice. So…you should do some practice. Let’s use the same graph, and I’ll ask you a few more questions, increasing the complexity as I go. 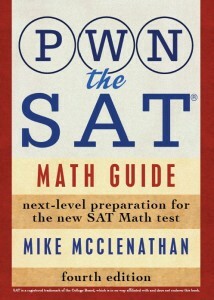 Note: The questions above are meant to help you practice this concept, not necessarily represent actual SAT questions. Therefore, although you know you’ll never have negative answers on an SAT grid-in, you can (and will) have negative answers here. These are super fun, right? Wow, I got all of those practices right! This blog is super helpful, and I’m hoping for a great improvement on this coming December SAT. If I ever meet you, I will bow down! Is the answer-viewing function still working? I can’t view them on my computer or my tablet. i love this blog…. i don’t even need a tutor anymore! If f(–1) = e, what is f(e) – 6? I got -2 because e=4 and 4-6 is 2. If f(–3) = r, what is f(f(r))? how did you get the 5 to turn negative? I’m so confused on both these problems. 1) Careful! e = 4, but f(e) ≠ 4. You have to put 4 back through the function. 2) Pay close attention to the f’s. Every time you see an f, you need to do the function again. So f(f(5)) means do f(5), and then do the function again! f(5) = –5, so f(f(5)) = f(–5) = 2. I think what you did is found f(–6), which is –1, then applied the negative sign to get 1. Your mistake is that you need to apply the negative sign before you evaluate the function, since the negative sign is inside the parentheses. If 2d =2, then how is 2f (2d) = 2*1, where did the 1 come from? I didn’t get f(-1)=e, what is f(e)-6? How did you get -9?